More robust than Beck’s Pilsner, annually besting Sam Adams and Pete’s Wicked Octoberfests with its cavernous toasted grain mesh, caramelized malt tether, and zesty citric spike. Random winey cider nuance wavers beneath. 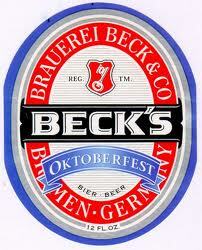 Beck’s trademark sour yeast pungency relegated to mere backdrop that won’t scare off amateurs.